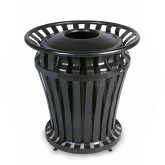 WeatherGard® Series Waste Receptacles stand firm and strong against the harshest elements. Steel cable mechanism secures lid to container to help prevent theft. 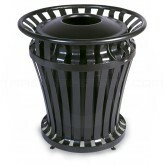 Molded-in handles enable easy removal of Brute® Liner, included. Adjustable feet help stabilize container on uneven surfaces. 3/16" (.5 cm) steel construction. UV-stabilized powder coat finish. No assembly required.